Some perhaps random ruminating on the relationship between religion and science, wisdom and knowledge. From the 18th century onward, Western human beings increasingly have forgotten the value of wisdom. And the result is that Western culture has been tempted either to jettison religious insight all together, or to twist it out of shape and make it into something it was never intended to be — to force it into a scientific paradigm where truth is tied to empirical verifiability. Westerners have forgotten that religious traditions are really wisdom traditions that emerge not out of an objective plane of empirically verifiable data, but that emerge out of the human experience of living. When we live reflectively, when we take time to contemplate our lives, we make discoveries that cannot be measured or detected by any scientific instrument. We come to know our humanity from the inside; scientific method can only know our humanity from the outside. In the history of science, there has been a tendency to discount human experience as unreliable because it is quite subjective. And yet, life itself is experience. The experience of being human is our life! Religion, including Christianity, is not something given to us from outside ourselves — at least, not initially. Religion arises from individual and collective human experience. That experience gives us an intimation of something greater than ourselves, something that surpasses and transcends us. It gives us an intimation of the sacred, and that intimation is known in human history by many names. In our tradition, it is named God, and Christ, and Spirit. Ultimately, the need to share the experience from which this intimation arises, to initiate others into that experience, gives rise to religious ritual, sacred texts, and institutions like the church. But ritual, text, and institution are all really attempting to do the same thing: to transmit the wisdom that flows from the original experience. And that original experience itself flowed from the concrete lives of particular people or communities. If we can recognize Christianity as a wisdom tradition, and if we can see the Bible as functioning within that tradition to transmit the wisdom that flows from a collection of religious experiences, then perhaps we can recognize that religion and science are really complementary traditions rather than competing traditions. Science gives us knowledge that helps us understand our world, our universe, our bodies, and how these things work. Religion gives us wisdom about how to live as human beings within this world, this universe, these bodies. Religion gives us wisdom about how to live meaningfully and in right relationship. And, religion helps us to discover within ourselves, and thus within the world around us, intimations of the sacred, our connection with God. But this connection is not something that can probably ever be empirically proven, and thus become a truth that is scientifically available. That connection is a truth that is only available to us through our own experience of being human and our reflection upon that experience. Science is able to tell us how life works, and how life on our planet is interrelated. Religion is able to tell us what life means, and how my particular life as a human being (or my particular community) is meaningfully connected to other human beings and human communities, and even how I am meaningfully connected to the larger creation. If we can appreciate this, then we can appreciate a reading of the Genesis creation stories as not telling us HOW the world works or came into being, but as telling us WHY the world works and came into being, and perhaps more importantly, what that creation MEANS to us in the context of our experience of being human. 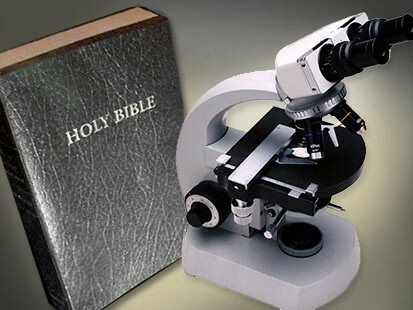 I would say that science and religion are both means of accessing and exploring Truth as an objective value; science does so indirectly through the exploration of relationships between things within creation, and religion through an examination of the relationship between creature and Creator. In that sense, the two disciplines operate less in parallel than as divergent, albeit complementary methods. Both, however, share a common source in the experience of the self. Before any person can engage in the search for Truth, he must first imagine that there is a self, but one which does not hold a monopoly on being. After inventing himself, man must imagine the “other.” This imagining, as all other acts of imagination, is essentially an unbidden act in which Truth reveals some aspect of itself to man’s intellect. From this revelation springs the exploration of Being/Truth, which is the object of both science and religion. From this perspective, the Genesis account of Creation describes how, whenever any of us sin, we repeat man’s falls from an enlightened condition of understanding the objectivity of Truth into the false belief that Truth is determined by man, that it is subjective. The fall of our first parents, describes how both sin and folly follow from the assent of the will (Adam) to a passion (Eve) disordered from its natural object, which is Truth. I would also assert that it is, in fact, possible to prove religious propositions, like the existence of God. Proof is merely the demonstration of the compatibility of a proposition with an accepted truth. In that sense, it is quite possible to reconcile faith in God with reason. Too often, I think, we are frightened off from this claim by the misunderstanding that proof requires the demonstration of necessity, rather than simple compatibility.